According to the Federal Housing Finance Agency’s (FHFA) most recent collected data analysis, The HARP Refinance Program has certainly hit home for many homeowners who were struggling with their high monthly mortgage payments, owing more than their home’s value. In August 2013, 68,340 refinances were completed through HARP, bringing the total refinances through HARP from the inception of the program to 2,886,856. Since the Home Affordable Refinance Program is near halfway through its term, which was launched in March 2009 and revised as HARP 2.0 in September 2011 with a sunset of December 2015, in order to determine how effective the FHFA’s Administration and oversight of HARP the FHFA Office of Inspector General (OIG) carried out a mid program assessment. It was found that as of March 2013, there have been 2.4 million HARP Refinances. It is however, hard to determine the number of HARP – eligible loans to be refinanced. The intention of the HARP Program initially was to reach and help up to four or five million homeowners. Nonetheless, there were several obstacles, including lender participation, willingness to refinance on a borrower’s part, and interest rates that has made the estimate challenging. 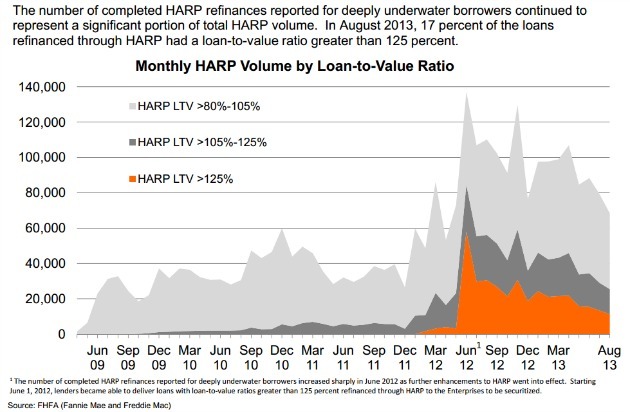 Due to the lower than predicted completion of HARP refinances, the FHFA is launching a campaign to better promote the HARP Refinance Program to reach more eligible underwater homeowners. The campaign encourages responsible homeowners who have been current on their mortgage payments to speak with a lender about the option of refinancing so that they can take in a more affordable monthly mortgage payment or take advantage of a loan term to relieve them of any financial stress. Especially with the mortgage rates lower than it has ever been, now is the time for these homeowners to take advantage of mortgage rate reduction, refinance into a more stable loan term or increase their equity faster by switching over to a shorter loan term. Since the inception of the Home Affordable Refinance Program (HARP) more than 2.8 million homeowners today have been able to refinance their mortgage with HARP 2.0. The Home Affordable Refinance Program (HARP) was established by the Obama Administration’s #MyRefi Plan and set forth by the Federal Housing Finance Agency (FHFA) in March 2009 to give responsible homeowners with an underwater or near underwater mortgage a chance to refinance to a lower monthly mortgage payment or a better and shorter loan term. However, due to the Loan-To-Value Limitations that prevented several homeowners to qualify for the program, the LTV limitations was then removed in December of 2011 and the program was extended until December 31, 2015 to try and allow more homeowners a chance to Refinance. Instead of the settlement date used originally to determine a borrower’s eligibility for a HARP Loan, the mortgage refinanced must have a note date either on or before May 31, 2009 and this requirement now applies to Freddie Mac and Fannie Mae Relief Refinance Programs. Please also note: The Database of Fannie Mae and Freddie Mac will be updated starting the weekend of the November 16, 2013. Any application that is taken prior to the update will still be based on a copy of the note that is being refinanced. In addition to the eligibility process, the eligibility will still be verified and confirmed from the DU Refi Plus database once updated. What this all means is that when you close your loan, it is possible for the bank to sell your loan to Fannie Mae or Freddie Mac whenever. However, this would not affect your loan in any way, nor would you even be able to take notice of this happening. In the original guideline, the Home Affordable Refinance Program (HARP) cutoff date to check a borrower’s eligibility was based in the date that the loan was sold to or purchased by Fannie or Freddie. This purchase date could have been weeks or even months after the closing of the loan. The recent change is much more beneficial and leaves the cutoff date as May 31, 2009, but still allows for lenders to use the “Note” date to determine eligibility (you can find this note date in your mortgage note along with the closing papers).